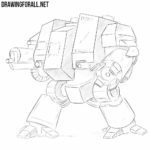 Today we will draw one of the most ancient and frightening races of the Warhammer 40 000 universe. We are talking about terrible Chaos. 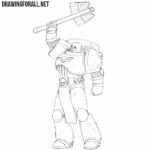 We love Warhammer and have already created some drawing tutorials about this. 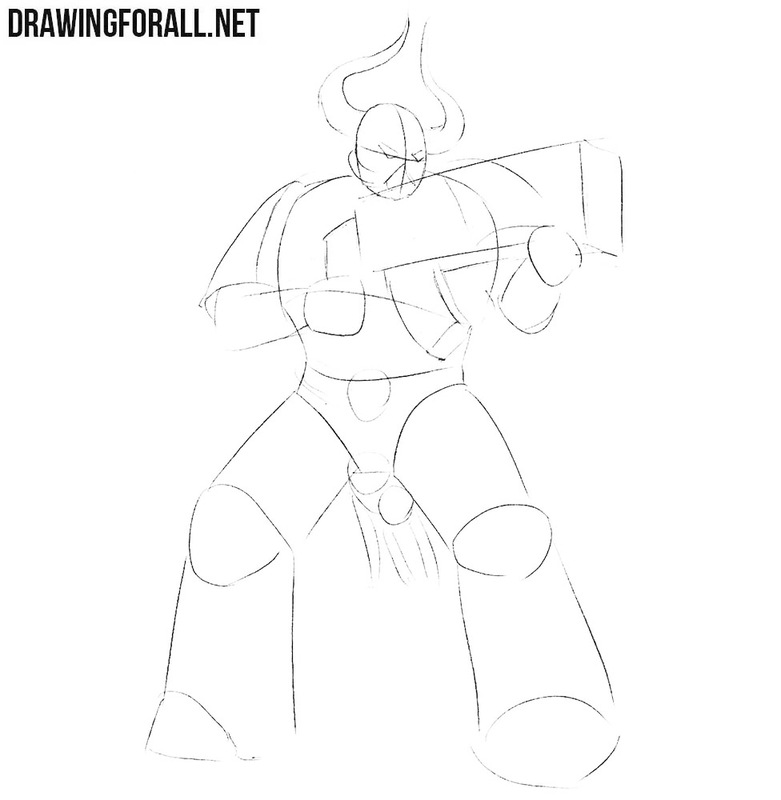 But today we decided to do a lesson on how to draw a Chaos Space Marine. We are convinced that Chaos Space Marine is one of the most memorable and unusual units in the whole Warhammer 40 000 universe. Let’s start it! 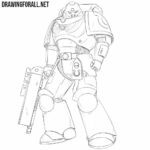 Chaos Space Marine have a very powerful and heavy armor, which we will try to depict. The contours of the armor make the silhouette of a Chaos Space Marine so large and wide. Draw a head and a line of a backbone on which we sketch out a wide thorax and pelvis. With the help of ordinary lines, we sketch out the arms and legs. The lines on the first steps should be very light so that in the future we could erase them. 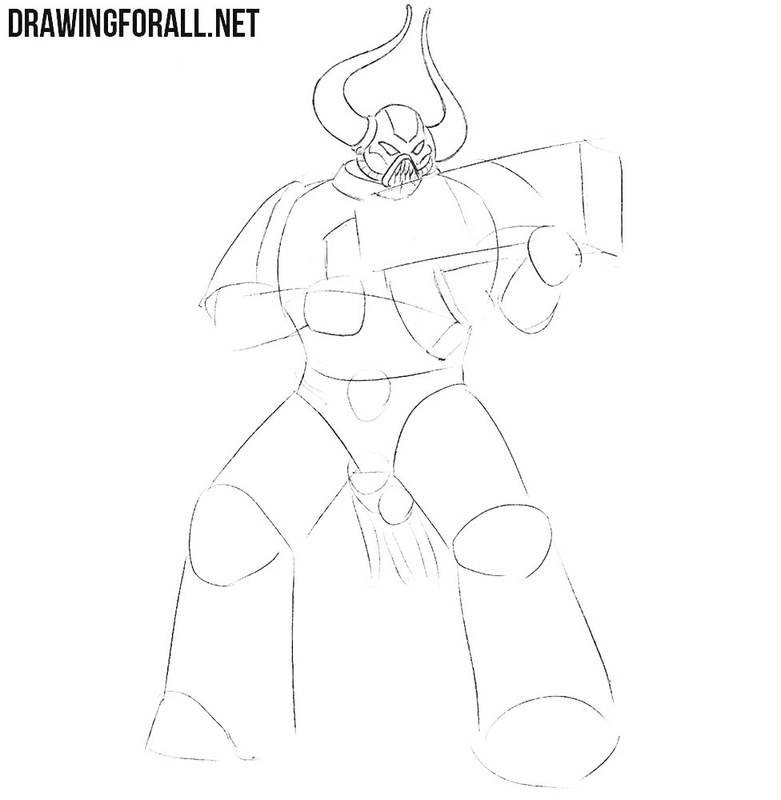 In the last step we drew stickman and now we can draw two crossing lines on the face of a Chaos Space Marine, which will help us further outline the details of the helmet. After that you can draw the contours of very wide and massive body, which nevertheless has a noticeable narrowing from the thorax to the pelvis. 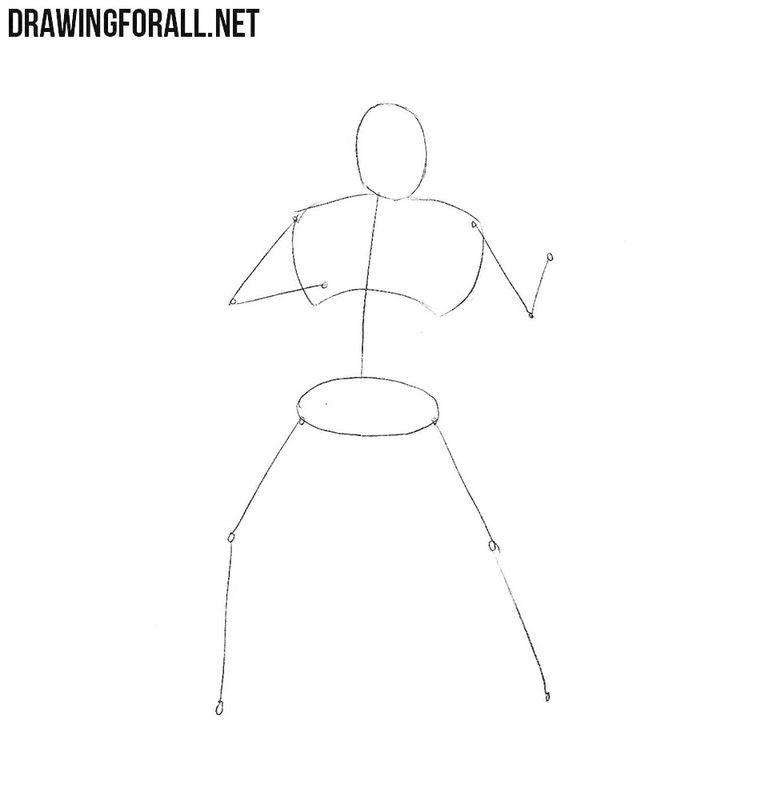 After that you can draw the arms and legs, which must be sketched with wide geometric figures. So we have a charater that dressed in armor from helmet to the boots, and it is this armor that we will draw now. Starting from the head, we will outline a helmet with huge horns. Then go to the corpus, outlining armor with ordinary light lines. In the hands we sketch out the gun as you can see in our picture. Now let’s work with details. By tradition we will do this in direction from the head to the legs. Draw out the contours of this scary helmet, long horns and mask with sharp teeth. Do not forget to draw the edges that are located on the bottom of the helmet and at the base of the horns. 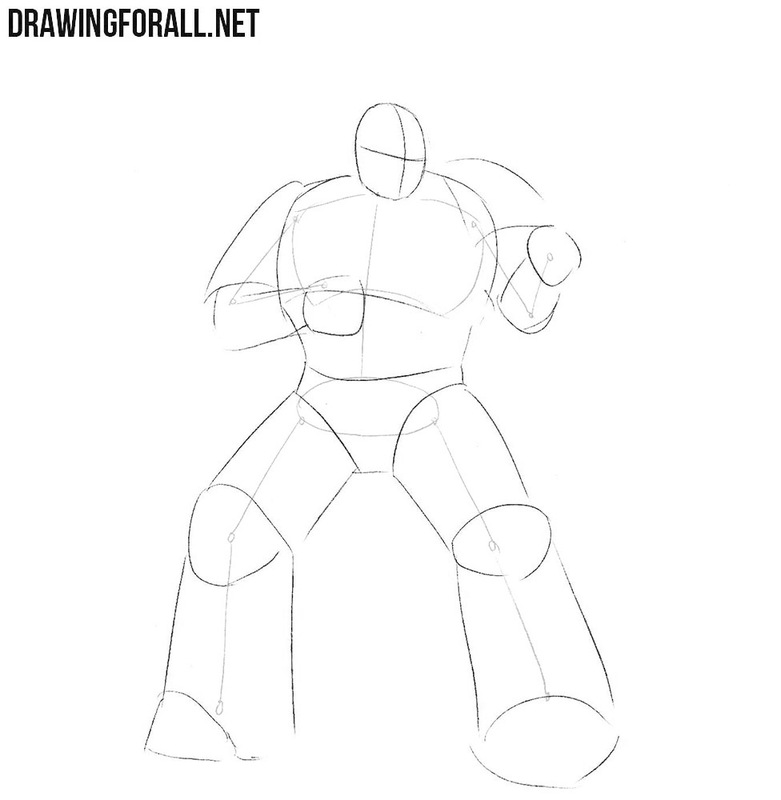 In this step we will draw armor that protect the body. We draw a smooth rim projected on the lower margin of the thorax and armor on the stomach. After that we remove all the unnecessary extra lines from previous steps to make our Chaos Space Marine more clean and neat. Now we draw the details of the arms. 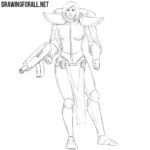 We do not have to draw the articulations and muscles but we will draw the outlines of massive shoulder pads, spikes, and armor on the forearms. 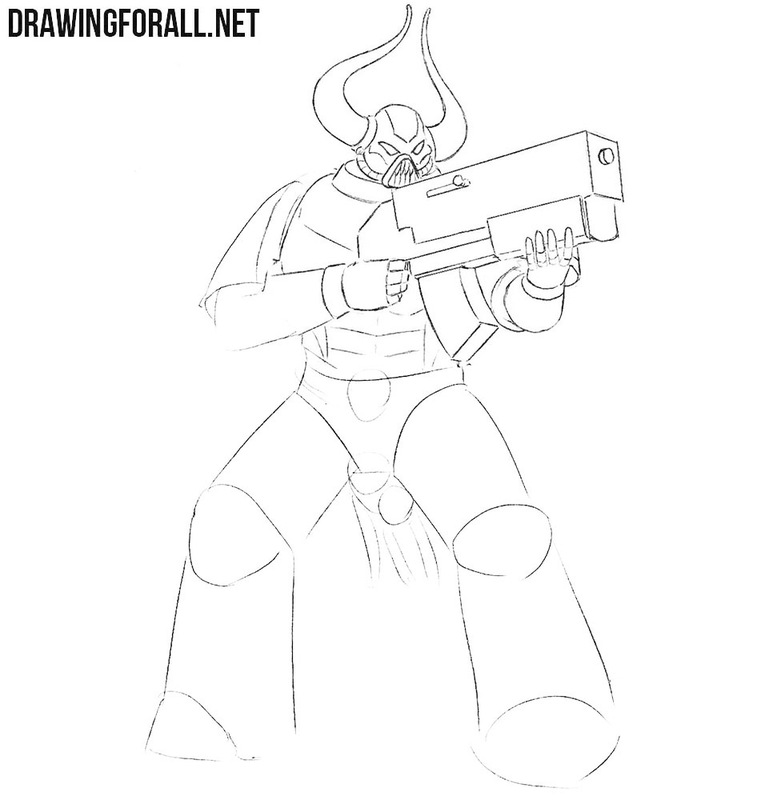 And, of course, we have to draw palms and Space Marine’s gun. We can move on to the lower part of the body. By the same way as in the previous step, we draw the legs and massive armor boots. Note thath the lines should not be very smooth. Do not forget to draw the sign of Chaos in the form of a skull that hangs on the belt. 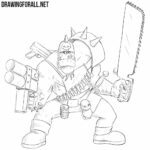 So Chaos Space Marine is almost finished, and we just have to make it more realistic and voluminous. To do this, we will draw the shadows using the classic hatching method. As you can see, the hatching here lies in the least illuminated areas of the Chaos Space Marine, that is, where light does not fall.